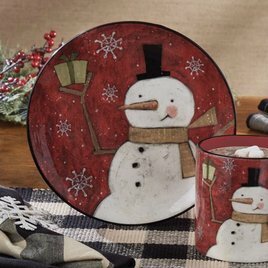 The Snow Friends Snowman Salad Plate brings a touch of whimsy to your get-together. This familiar wintry character, like Frosty, carries a gift to help you celebrate the Holiday Season. Add to your table setting today. You'll love the whimsy of the Day Snowman Gumdrop Candle Sleeve. A great change of scenery to your candle sleeve collection or as a gift. Add the glow of candlelight, without the worry of a burning candle. Peace of mind and it’s beautiful!